After a startling turn of events at the end of its prequel Red Queen, Aveyard’s Glass Sword invites readers to uncover the truth behind the most heart-breaking and unforeseen betrayal Mare Barrow never expected to face. With a new mission at hand and the addition of an abundance of new characters to this epic take, Glass Sword presents a wide range of fascinating facets to this highly anticipated sequel. Will Mare be able to cope with all that has happened to her? Will her mission succeed? Will Glass Sword compare to its predecessor? 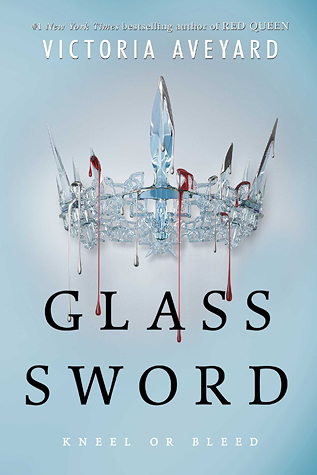 After reading Red Queen, I went straight to Chapters and bought Glass Sword – I HAD to know what happened after that insanely tense ending. Red Queen was so enticing and full of adventure, it was hard to put the book down. So, I figured that Glass Sword would be the same. Was I right? It was okay. I liked the book but it wasn’t as good as Red Queen. Funny enough, I was shocked. Glass Sword has more action, grander world exploration, further detail into the newbloods, and has introduced a number of fascinating characters. So why wasn’t it as good? Let’s examine! Due to this being the sequel, there may be spoilers from the first novel. I will try to limit this, but please don’t read if you desire to have Red Queen unspoiled. Red Queen left readers with a crazy amount of questions: What are newbloods? When did those with Red blood begin to gain abilities? What is the origins of Silver blooded and New blooded people? What will happen with the kingdom, due to the new leadership? We’re left off with the world crumbling into chaos, tensions between those with Silver blood and those with Red blood on the rise. Mare and Cal are saved by the Scarlet Guard, fleeing King Maven and his Silver fighters. Though Mare and Cal’s lives have been ripped apart and leave no room for trust, they’re desire to destroy King Maven leaves them and a group from the Scarlet Guard to go find other Red bloods, attempting to save them from the horrendous fate of being captured by King Maven and Queen Elara. The story really drove it home for me – It’s the best part of Glass Sword. It’s very fast past, moving fluidly from one point to the next. Mare’s journey finally grows more complex, bringing in multiple facets to the tale. We have the on and off trust issues with Mare and Cal, more insight into the Scarlet Guard, a crew of rogue individuals who join Mare and Cal to find New bloods, the discovery of other New blood abilities, and tension creeping in the story as Mare begins a dark and dangerous path – one she may not come out of completely human. Not only is the plot spectacular but it’s diverse. It doesn’t simply divide between good versus evil, actions being deemed black or white. There’s a vast amount of moral complexity and development to Glass Sword, driving the story to its full potential. The choices made have severe consequences, both good and bad. The story really focuses on the theme of good versus evil but in a very unconventional manner. Rather than the heroes being pure good and the villains being pure evil, Aveyard’s story demonstrates a more realistic approach – there’s no such thing as simple as good and evil. Further to the point, the character development is wonderfully done in Glass Sword. Characters don’t simply grow – they take one step forward, two steps back, add a few somersaults, fall down steep hills, climb back up again, only to discover they have no clue of what they’re doing…how their choices not only cause massive consequences to the world and those within it, but to themselves. Mare and Cal are two characters who really go through this moral complexity. Cal goes through the issue of working with Red bloods but not wanting to harm Silver bloods. It was really hard to like his character as some points; he doesn’t want to necessarily cause harm to Red bloods but he is extremely reluctant to kill Silvers and fight for some sort of balance in the world – to change the way in which Silvers have been controlling the Reds. He doesn’t want death…but sometimes, it’s inevitable. Sometimes, revolutions are needed for change. Mare goes through a darker path, slowly becoming someone that her friends and family can’t seem to recognize anymore. Honestly, this is to be expected. She had to change her identity, leave her family behind, was betrayed by the love of her life, and feels at a loss when trying to save people. She’s only 17 years old, yet she has the weight of so many on her shoulders. If she didn’t have some sort of mental break, I probably would’ve had given this a two star due to being unrelatable and unrealistic. Her internal struggles were some of my favourite parts of the novel; I felt like I could connect on some level, understanding her and appreciating her character so much more than Red Queen. As I’ve said, I enjoyed Glass Sword. The plot was well thought out, the character development pulls readers in, and the introduction of new characters really brought the story to life. However, one thing that drove me nuts was characters’ reactions to Mare and how Aveyard portrayed her. Characters were constantly seeing her as a monster, as someone who has no control and no regard for others. But it’s the complete opposite! I felt like everyone was attacking Mare the entire time, which drove me bonkers. Furthermore, Mare believes half these things herself. I didn’t like how Aveyard portrayed Mare as this character who was more of a monster than human, that what her friends and family were saying was justified – it felt unfair and unjustified. Personally, Mare slowly succumbing to what people think of her and agreeing with them tarnished her character a bit. No, she’s not perfect – obviously. Honestly, she goes a little crazy in this book and has some points where I was disappointed in her for thinking more of the New bloods and forgetting that the Reds also need protection. But it made her real! The book felt like an attack on her character, as though Mare turned into a beast and everything was her fault. I may be going overboard, but that’s honestly how I felt. I was so frustrated for I felt like all the other characters were aggravating. It’s like in the Walking Dead, when characters chose Rick as a leader but get mad at all his decisions…then they still follow him because they can’t make decisions! I have a really hard time enjoying plots that encompass this need to always target the main character as a monster. They aren’t perfect, but who is? And don’t complain and blindly follow them if you are so incline to judge every little thing they do. Lastly, the plot sometimes got a little boring. I was really shocked, since most of it is pretty fast paced and action packed. Nevertheless, it sometimes was hard to concentrate on the book. Overall, the book was really well done. Most people seem to give this a four star, so know that’s a pretty good indicator of how much the public likes Glass Sword. The one of my two reasons is a little biased, but this is my personal thoughts. If you liked Red Queen, you won’t be disappointed in Glass Sword. It’s intense, full of complexity and moral ambiguity, rich in content, and has a fascinating turn of events at the end! This one and the series has been on my maybe list for a while. What do you think of the series overall? I do like it – I’m going to post a review for Kings Cage next week. I’m a little peeved that it was turned into a 4 book series…but I can get over it. It is good! The first and third are my favs so far. If you like Hunger Games but with abilities and a more open world, you’ll like this. If you do, please tell me what you think! I’m super curious!